It's always nice to find a good story about ninjas, especially given the penchant for loud voices, orange jumpsuits, and an overall lack of anything remotely resembling stealth or cunning (believe it!). Thankfully, Souten no Komori (or, A Bat in the Blue Sky), is nothing like a certain anime series. 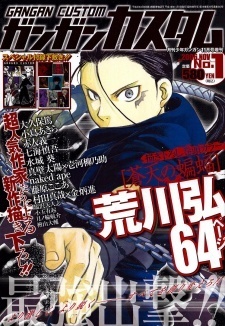 The manga is by Arakawa Hiromu, a mangaka whose name should ring some bells with people, especially as she is the creator of the Full Metal Alchemist and Jyuushin Enbu: Hero Tales manga. Although she is the brains behind one of the most popular franchises in anime and manga, her body of work also includes a few surprisingly good one-shots. The story is about an outcast kunoichi called Henpukumaru (so named because of the bat shaped birthmark on her cheek), who is found injured in Isokawa mansion, home of the young lord Chiyozuru. Since this is a one-shot I won't say any more as that would give away the story. Overall this is a very well put together tale. The fact that this is a one-shot means that the plot proceeds at a very good pace, with no real hang ups or snags along the way. The art is very simple and clean. The backgrounds are a little on the utilitarian side, but serve their purpose well as the reader is more focused on the action. The characters are nicely done on the whole, although they are fairly simplistic in their own way. That said, Arakawa makes good use of the eyes to display various emotions. There isn't really much in the way of character, which is understandable given the length of the manga. However, what development there is effectively goes to one person - Henpukumaru. The change she undergoes due to Chiyozuru's influence is very well handled, and is tempered with her recollections of her violent past. As for the ninjas, well, they're as one would expect them to be - silent, cold, deadly. This is a highly enjoyable one-shot that should appeal to most people who like action or drama, or to fans of FMA or Jyuushin Enbu. It's a straightforward tale which doesn't really hold itself back or shy away from it's subject matter, and I thoroughly enjoyed it. Souten no Komori is ultimately a story about redemption, and also forgiving oneself for one's sins. The most impressive thing about it is that Arakawa manages to get this message across to the reader in only 64 pages, even with the involvement of ninjas.